In business, people say ‘dress for the job you want’. Whether it's that all-important presentation, deal, or networking event, a men’s tailored white dress shirt is one of the best investments anyone can make. Take our word for it, your colleagues, manager, the board of directors, everyone will notice the difference. 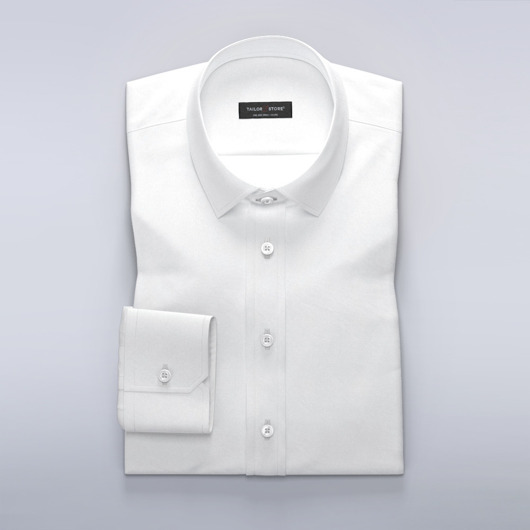 That impeccable tailor-made white shirt sewn only for you will turn heads, elevating your self-confidence to new levels. Interview, sales pitch, or dinner with someone special? Dressed in your pristine made-to-measure white shirt you’ll be ready for anything the day or night brings. Win back hours from the ironing board with an easy-iron white dress shirt. Whatever fabric or style you choose, a tailored men’s dress shirt is a wardrobe must for anyone who believes in working smart. We offer a wide range of classic white dress shirt styles, all ready to be tailored to your measurements. Looking for something special. Create your own fully personalised one-of-a-kind white shirt in our easy-to-use shirt design tool. The white dress shirt for men is one of fashion’s most versatile garments. The possibilities are almost endless. A perfect-fit makes all the difference. Elevating your white dress shirt and look to new heights of sophistication. Browse our selection of recommended white made-to-measure dress shirts for creative inspiration and styling ideas. The most popular way to wear a white dress shirt is with a dark business suit. For more smart-casual work environments, or dress-down days, consider wearing your white shirt with denim jeans and a suit or sports jacket. Whatever your preference, choose a formal white business shirt in a lighter fabric like poplin, satin, dobby or twill. Satin in particular has a subtle lustre, giving your white made-to-measure business shirt a luxurious feel. For the ultimate dapper office look, why not try mother-of-pearl buttons for an eye-catching effect. Prefer cufflinks? We have a stunning selection of accessories that pair perfectly with your made-to-measure white business shirt. Want a more relaxed look with your men’s white dress shirt? Denim or chinos are a perfect match for the color white. Wear your new tailored business shirt with an open-collar and rolled up sleeves for a masterclass in smart-casual style. 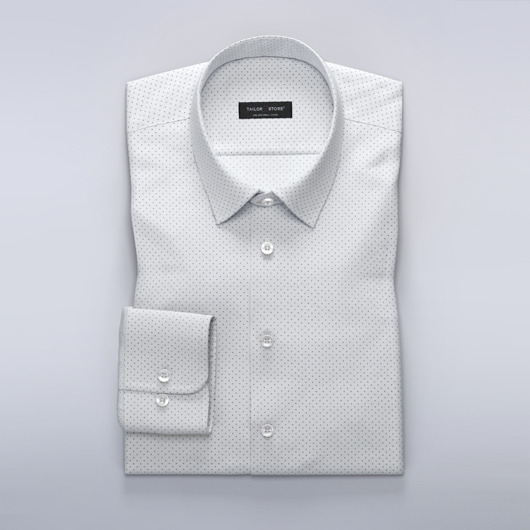 When it comes to white business shirts, a perfectly tailored fit makes all the difference. Never compromise on quality. An expertly made tailored white business shirt will make you look and feel your very best. What about the weekend? We’ve got you covered with our always popular best-selling tailored casual white Oxford shirts. Perfect for beach parties, barbecues or dinner with friends, our made-to-measure white Oxford shirts are a versatile style choice. Made from a slightly thicker fabric than a business shirt, a white Oxford dress shirt looks great paired with jeans, under a sweater or when worn with a blazer. White Oxford shirts typically feature button-down collars. Other casual white shirts can have any type of collar, such as classic collars, modern, or cut-away collars. Feel free to browse our wide range of casual white shirts and customize any of them with our shirt designer. A tailor made formal white shirt is one of the most important garments you’ll ever buy. Your made-to-measure shirt will be at your side through all the biggest events and occasions life has to offer. That dream job interview, your first date, a New Year’s celebration, and of course your wedding day. Dressed in your perfect-fit formal white shirt, you’ll brim with confidence, feeling and looking your very best when it counts the most. Wear your formal white shirt with a made-to-measure dinner suit or tuxedo.